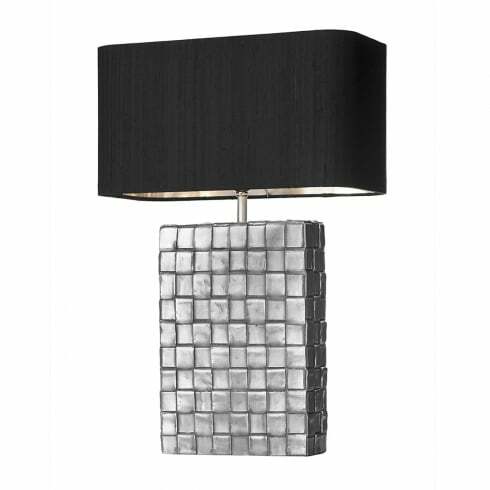 David Hunt Lighting Element is a single light resin table lamp in a pewter chrome finish and is shown with a 100% black silk shade with beautiful silver metallic lining. The product code for this David Hunt Lighting table lamp is ELE436. This British made table lamp with its intricate woven lead base and braided cable is a unique rectangular shaped fitting which along with its stunning black silk shade will provide ambient lighting to any modern or contemporary space. Operated by a push bar switch. David Hunt offer an array of stylish table lamps for all decors which can be viewed and ordered via our website.